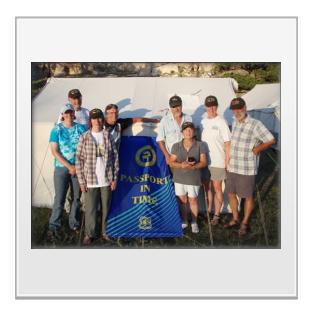 Seven volunteers from five states came to Outlaw Campground on July 17, 2011, to participate in the Buffalo Field Office's (BFO) second Passport in Time (PIT) project. 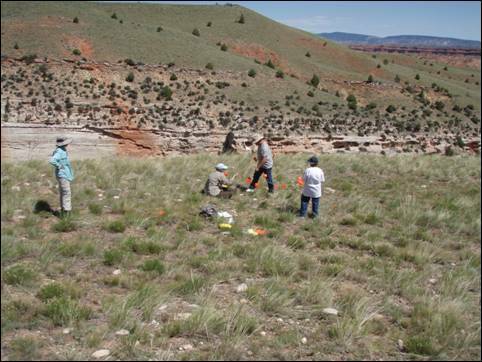 Volunteers contributed a total of 264 hours to completing site condition reports, completely rerecording previously recorded sites, recording new sites, investigating site leads, and surveying for new sites in the Middle Fork Recreation Area. 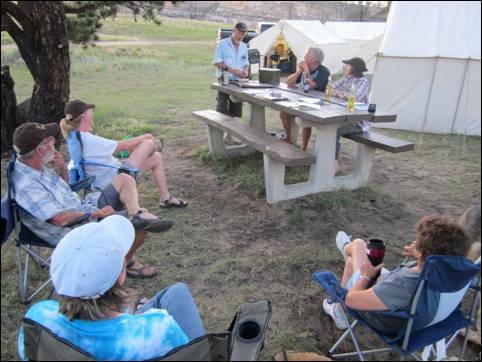 The volunteer crew was briefed by the BLM Archaeologist about the area, prehistoric and historic land use, cultural resource laws and practices, and site recording procedures, as well as information about site ethics and the importance of the archaeological record. Throughout the week, volunteers learned to produce plan-view maps using either the Trimble Geo XT or XM. Volunteers also learned to record debitage characteristics and collect information including material type, material color, stage (primary, secondary, tertiary, or shatter), presence or absence of cortex, and presence or absence of burning or heat treating. The debitage assemblages were also classified as to size class using graduated hardware cloth. Tools were point-plotted and photographed, and attributes such as material type, material color, completeness, presence or absence of cortex, presence or absence of burning or heat treating, and length, width, and thickness in millimeters, were recorded by the volunteers. 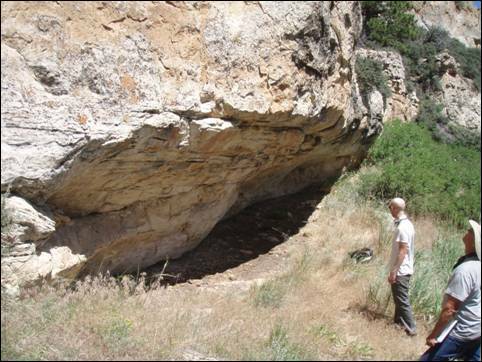 Seven newly recorded sites were intensively recorded, including two rockshelters, one open camp, one lithic procurement site, and three lithic scatters. 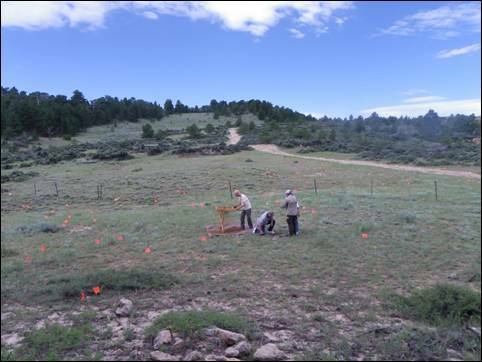 Eight previously recorded sites were completely updated using GPS units; all debitage and tools were analyzed; site overview photographs were taken; and when appropriate, shovel tests to assess subsurface potential were excavated. Condition reports, a locational point taken with either a Trimble Geo XT or XM unit, and photographs were completed for five previously recorded sites. 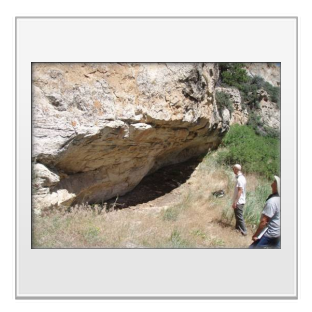 The week before the 2011 PIT project, new graffiti was discovered at the BFO's only interpretive site, the Sweem-Taylor rock shelter. One set of initials was scratched into the rock surface and then filled in with a black marker; several other names were written with presumably the same black marker. The PIT crew photographed and documented the vandalism. 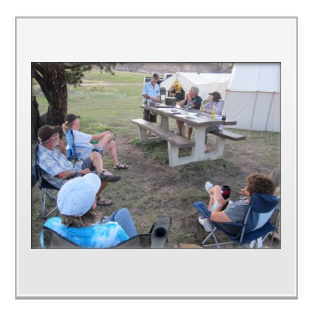 The night of July 21st, Dr. Richard Adams of the Office of the Wyoming State Archaeologist visited Outlaw Campground and spoke to the volunteers about high altitude, Eastern Shoshone villages dating from the Late Prehistoric and Protohistoric periods. Volunteers also tried some native foods, including pemmican, and viewed a range of artifacts from projectile points to a soapstone bowl. 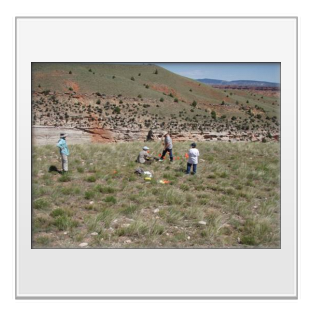 The presentation gave the volunteers another perspective on archaeology in Wyoming. 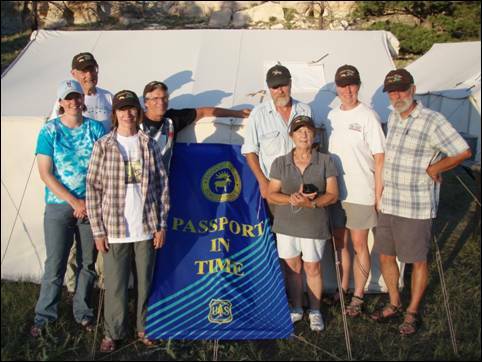 By the end of the week, this incredibly hardworking group of volunteers had revisited five previously recorded sites, completely updated eight previously recorded sites, and identified and recorded seven new sites. 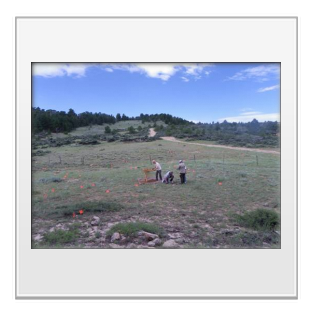 The important work done by the PIT crew this year will allow the BLM to determine respective eligibility for the National Register of Historic Places and establish a management plan for the important resources of this area. Special thanks go to Margaret Allen and John Crawford, Ben and Ann Darling, Reid Kukowski, Roy Plank, and Roberta Williams for volunteering their time; Seth Lambert for working with a volunteer crew on July 20th and 21st; Dr. Richard Adams of the Office of the Wyoming State Archaeologist, for taking time the evening of July 21st to do a presentation; and BLM Wyoming for funding the project.